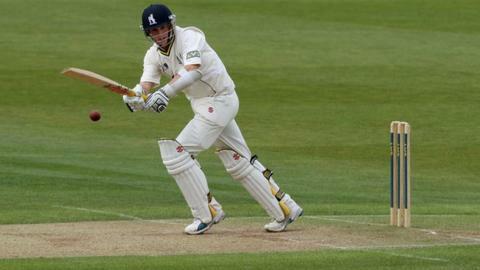 Warwickshire and England all-rounder Chris Woakes has signed a new two-year contract at Edgbaston. Woakes, 24, has been with the Bears his whole career and made his Test debut against Australia at The Oval in 2013. "I've been at Warwickshire for 13 years, so the opportunity to extend my contract was something I was very keen to do," Woakes told the club website. "We've got a great set-up and an incredibly strong squad that can compete for silverware." Woakes is a product of the club's development programme and has scored more than 3,000 runs and taken 290 wickets since making his first-class debut in 2006. He helped the county win the 40-over competition in 2010 and the County Championship two years later, when he averaged over 70 with the bat and picked up 47 wickets. He made his limited-overs debut for England in a Twenty20 international against Australia in Adelaide in 2011, hitting the winning run in a last-ball victory. A one-day international debut followed against the same opposition soon after, but Woakes had to wait until the final game of last summer's Ashes series before winning his first Test cap. It proved a steep learning curve as he made scores of 25 and 17 not out, but only took one wicket at a cost of 96 runs, not enough for a place in the current Ashes series in Australia. Woakes' decision to extend his stay at Edgbaston has been warmly welcomed by the director of cricket Dougie Brown. "Chris has proved himself as an outstanding cricketer who can change the outcome of a match with bat and ball," he said. "He's still only 24 and we expect his best days to be ahead of him and we're delighted that those years will be spent here at Edgbaston."